This package contains a Master of Wicca credential handwritten by our church's scribe, a Wicca Guide for the Solitary Practitioner, badge, and bumper sticker. When you feel as though you have reached the next level of knowledge and skill in the study of Wicca, you can place an order for this Wiccan honorary degree. We will have the title drawn up by our church scribe in beautiful calligraphy on high quality credential paper, perfect for display. 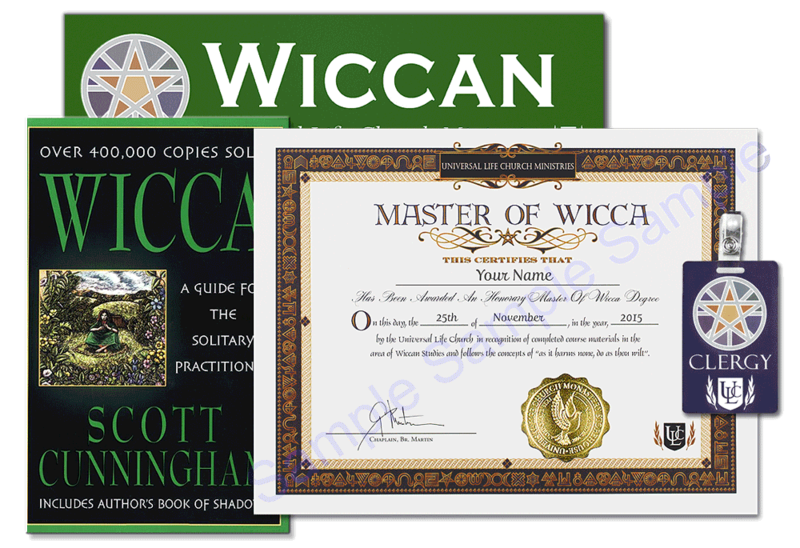 This package contains the Master of Wicca certificate in addition to our top selling wiccan book: Wicca Guide for the Solitary Practitioner, by Scott Cunningham, Pagan badge, and the Wiccan bumper sticker. Degrees requires 2 weeks to create before being shipped. FedEx shipping is not available for the degree, it will be sent at a later date.